MOROGORO, Tanzania, May 3 2013 (IPS) - Smallholder farmer Peter Mcharo, from Morogoro Region in eastern Tanzania, has a reason to smile. His fields are full of green, healthy maize plants, he has richer soil and he spends less time farming now than he did two years ago. Viewed as one of the major solutions to food insecurity and as a mechanism to adapt to climate change in Africa, conservation agriculture (CA) is giving Tanzanian smallholder farmers like Mcharo better harvests as the country faces an acute food shortage. On Apr. 22, Minister of Agriculture, Food Security and Cooperatives Christopher Chiza urged farmers to use CA, as 47 districts in this East African nation face a serious food shortage. This is despite a 12 percent surplus recorded during the 2011/2012 harvests. The regions affected include, Kilimanjaro, Lindi, Tanga, Mtwara, Coast, Iringa, Kagera, Mwanza and Singida. But Mcharo, who is from Kibaigwa village, told IPS: “In my five seasons of using the system, I have confirmed that it is better to use conservation agriculture as my colleagues in the village cooperative have made a larger profit per half hectare (compared to when we) cultivated a bigger piece of land.” Mcharo, and the 30 farmers in his village who belong to the Umoja (Unity in Swahili) cooperative, are all involved in CA. They are among a number of farmers in the country who have benefited from a CA farming project since the United Nations Food and Agriculture Organization (FAO) introduced it here in 1998. 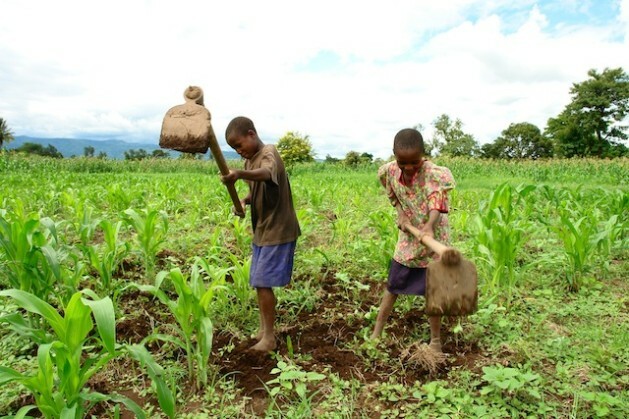 The FAO-supported project, run by the Ministry of Agriculture, Food Security and Cooperatives, has benefited some 4,000 smallholder farmers, in the central and northern regions of Morogoro, Kilosa, Mbeya, Arusha, Babati and Manyara. Conservation agriculture is a resource-efficient crop production practice that involves minimum or even zero mechanical disturbance of the soil, keeping the soil covered at all times – either by a growing crop or a dead mulch of crop residues – and using diversified crop rotation. In addition, the use of pesticides is reduced or avoided and biological control is encouraged. The emphasis is on simple, low-cost tools such as ox-drawn planters and rippers. A Brazilian invention, the Fitarelli no-till planter, is increasingly becoming a popular CA tool. This farming season, Mcharo used a ripper – a tool that causes minimum disturbance to the soil. He did not even till the land or use fertilisers, but the harvest from his 1.2-hectare farm has increased from barely 20kgs of maize per half hectare two years ago, to 50kgs on the same amount of land during the last harvest in November 2012. Mcharo also inter-crops groundnuts with his maize. The practice has also improved his way of life. Mcharo earned 250 dollars on his last harvest – almost three times what he made the previous year. The farmer, who has a family of nine, said he was able to re-roof his home with iron sheets, buy a power tiller and add another 1.2-hectares to his farmland where he will start growing rice next season. Agricultural engineer Mark Lyimo, from the Ministry of Agriculture, Food Security and Cooperatives, ran the initial phase of the implementation of CA and farm mechanisation for sustainable crop and livestock production. He told IPS that conservation tillage – zero or minimum tillage – is one of the practices that has proved to combat soil degradation efficiently. “This was necessary due to soil erosion and declining soil fertility that are threatening vast surfaces of agricultural lands in Africa and consequently the existence of farms and farming families,” he said. “The technology focuses mainly on sustainable production of crops under intensive cultivation of land where two crops, a legume and a cereal, are inter-cropped twice a year,” Lyimo said. According to the Ministry of Agriculture, Food Security and Cooperatives, maize and legumes and beans and groundnuts are usually intercropped together in the northern and central regions. He added that more work was needed to demonstrate that the technology can work in order to change the mindset of farmers who, for many years, were taught that it is necessary to plough and maintain a weed-free field for better crop production. Joseph Ndunguru, a researcher at the Mikocheni Agricultural Research Institute in Tanzania, said moist soils that remain undisturbed produce good yields for farmers throughout the year. “Besides reduced production costs, a farmer will find this technology time saving and less rigorous,” he said. CA is credited with eliminating power-intensive soil tillage and reducing labour required for crop production by more than 50 percent for small-scale farmers, according to Lenny Kasonga from the University of Dar es Salaam. Damian Gabagambi from Tanzania’s Sokoine University of Agriculture told IPS that the practice is good for farmers as it protects soil from vulnerability to drought by reducing water requirements by up to 30 percent. And Mcharo said that thanks to CA, his maize is greener and healthier. I wish someone would have proofread the article before it was printed. It say the farmer increased his yield from ’15 kg’ [that is only 1 debi…on over one acre of land…impossibly low yield. Did you mean 15 bags of maize, since it was sais the farmer bought (improved) seeds and fertilizer? And he received US dollars $106 for his harvest of 15 kg?? Then later his yield went to ’50kg’ [I don’t believe he harvested 50 bags, that is too much on just over an acre. But no one received $250 for 50 kg of maize. So you must read these articles before printing; make sure the corrections are made and the article makes sense to the reader. I appreciated being able to go to CONSERVATION AGRICULTURE with the hyperlink provided. That made the article worthwhile. This topis oc conservation agriculture, an alternative to agribusiness model is so important. So I hope for greater attention to detail. Thank you.